Major General Shantha Kottegoda will be appointed as the Sri Lanka army’s 17th commander from 1 July 2004. President Chandrika Kumaratunga, the commander in chief of the Sri Lankan armed forces, has approved his appointment despite speculation that she might extend the present SLA commander’s term for six months. Maj. Gen. Kottegoda, like his predecessor, is a senior intelligence officer. He was appointed to a special post as Overall Operations Commander (OOC) for the east after the LTTE crushed a renegade’s short-lived rebellion in the region. Maj. Gen. Shantha Kottegoda was a member of the back up team for the Sri Lankan government delegation that negotiated with the Liberation Tigers in six rounds of talks in 2002. 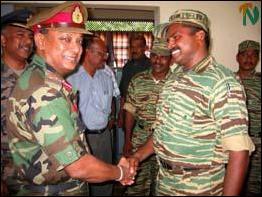 LTTE officials say that Maj. Gen. Kottegoda had developed a singular rapport with their renegade Batticaloa District commander Mr. Vinayagamoorthy Muraleetharan (Karuna). The British MI 5 trained him in intelligence gathering and analysis in 1991. Following the training program in UK, Maj. Gen. Kottegoda was seconded by the military as the head of the ‘Northern Terrorism Desk’ of Sri Lanka’s National Intelligence Bureau (now renamed Directorate of Internal Intelligence). Maj. Gen. Kottegoda joined the Light Infantry of the Sri Lanka army as a cadet officer on 5 February 1970 in the third intake. In 1973, he took the young officers’ course in India and later Company Support (weapons) course there. Maj. Gen. Kottegoda followed a special ‘Counter Insurgency’ in India’s secessionist northeast region in 1981. In 1983 he followed a company commander’s course in Assam again. In 1990 he served as the SLA’s co-ordinating officer for the Mullaithivu district. Maj. Gen. Kottegoda was the General Officer Commanding (GOC) of the SLA’s 55 Division during the Sri Lanka army’s Op. Jeya Sikurui against the LTTE in 1997-99. He also worked as the Sri Lankan Security Forces Commander for Vanni. Later he served as GOC of the 51 Division of the SLA in Jaffna. He was appointed the SLA’s chief of staff in 2003. He led the recapture of the SLA’s Pooneryn Base which the LTTE overran in November 1993. Maj. Gen. Kottegoda also led SLA’s "Operation Vanni Wickrema" in the Vanni and "Operation Green Belt" in Mannar. He is a resident of Kottegoda in the Matara District in Sri Lanka’s southern province.